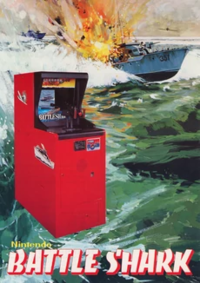 Battle Shark is an early arcade game by Nintendo. In this game, the player must shoot torpedo boats that emerge on the screen under a time limit of 70 seconds. A free game will be rewarded for a score greater than 8. This page was last edited on 23 March 2019, at 19:39.